I have wanted to write about menu planning for awhile, but have mixed feelings about it. On the one hand, it seems sort of silly. I have friends who make fun of my weekly “menu” on my dry erase board. 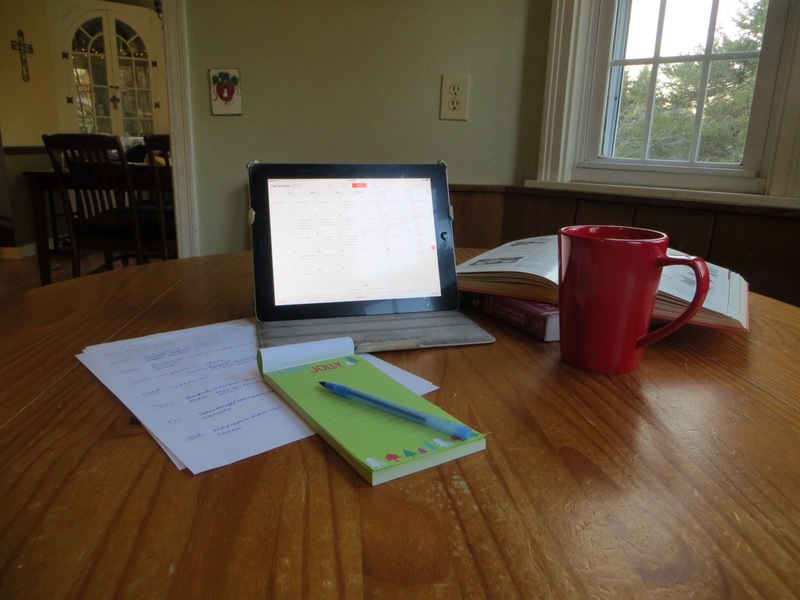 I am sure that many people are saying, “Well…how nice that you have time to sit down with a cup of coffee and PLAN what you are going to serve each night for dinner.” And still others who are thinking, “Why are you wasting our time telling us things that are basic, common sense?” So I have hesitated to write this post. But…if you talk to people about making dinner or you pick up any “women’s” magazine (I realize that there are many men who handle the “making of the dinner” task) or you read parenting blogs…you quickly realize that almost everyone seems to struggle with the constant, never ending challenge of figuring out what to make for dinner. There is something about the relentlessness of it (is “relentlessness” even a word??). There is no “season” of making dinner, like lawn mowing during the summer or changing diapers during the baby/toddler years. Yes, there are occasional “days off” when you go out to dinner or pick up take out. But, once you hit young adulthood, “Making Dinner” is something that you (or someone in your household) are going to be doing for the rest of your life…at least until you check into the nursing home! So I am going to write about it. Mock me if you must…but hopefully you will take away something helpful…whether you have all of the time in the world to think about dinner or your kids think that dinner always comes with a toy. 1. It saves time. Although it does take time to sit down and do the planning, once the meals have been chosen and the shopping has been done, I don’t usually have to go back to the store again that week. And I don’t have to spend any more time thinking about what to make or looking up recipes. The shopping trips themselves are also quicker because I have a pretty precise list of what I’m buying. 3. It keeps my family’s eating more nutritionally balanced. Maybe I would be perfectly happy eating pasta every night, but that’s probably not the best thing for our health. Menu planning ensures that we’ll have fish one night, red meat another, and an occasional vegetarian meal. 4. It fits dinner into our reality and makes it more likely to happen. Our life doesn’t look like the life of my childhood, where we sat down to dinner at 5:30 every single night. But when I plan around the carpool to karate and when I schedule leftovers for the night I have to go to a meeting…I’m not so tempted to pull into the drive through. 1. Make a master list of the things that you usually buy at the grocery store in the general order that you shop. I picked up a copy of my store’s directory and made my list according to the aisle numbers…I know that sounds over the top, but it has saved me a lot of time in the store. 2. Make a list of “Keeper Recipes” for each category of types of meals (Seafood, Chicken, Vegetarian, etc.). These are meals that you’ve made before that were easy enough and that the majority of your family liked. So if you need a chicken recipe for Tuesday, you have a list of 5 or 6 chicken ideas and where to find the recipe (or have hard copies of the recipes attached). 3. Bookmark the recipe indexes of 2 or 3 of your favorite food blogs so that you can easily refer to them for ideas. (My favorites are I’m an Organizing Junkie, Dinner, A Love Story and Simple Bites). 1. I sit down, in the kitchen, with my calendar, cookbooks/recipes (or whatever online recipe resources you might use) and two pieces of paper. 2. On the first piece of paper, I write down the days of the upcoming week and notes about what is going on with our schedule for the week that might affect dinner. 3. Then I take a look in my fridge/freezer to see what I already have that can be used for any meals this week. 4. Next, I start jotting down (in pencil) possible meals next to each day of the week, making sure not to plan anything time consuming for busy nights. I usually only plan about 5 meals each week since there are usually at least two nights that we get take out/eat out or have leftovers. If we are having fish, I try to plan that for the day that I am purchasing it. I don’t have a set type of meal for each night (e.g. Soup on Mondays, Fish on Fridays) but I make sure to keep things balanced out each week. 5. This next point addresses my menu planning weakness…try not to plan more than one “new” recipe per week. I tend to get lost in looking at different recipes, especially when I’m online. What was supposed to be a relatively quick planning session can turn into an hour of wandering from site to site trying to decide what new recipes to try. I love making new things and could easily spend all day perusing cookbooks and food blogs! Instead, I use my lists of “Keeper Recipes” (see “Before You Menu Plan” above) for most of the meals. 6. Once I’ve decided what I’m making for the week, I write down where to find the recipe next to each item (I bookmark any online recipes or save them in my Evernote app) or if I have an actual hard copy of a recipe, I pull it out. Then I take the paper with the Days of the Week/Meals/Recipe Locations and any hard copies of recipes and put them on a magnetic clip hanging on the side of my fridge. 7. On the second sheet of paper, using the recipes, I make up my grocery list. Don’t forget to include items you need for breakfasts/lunches/snacks. I don’t “menu plan” for meals other than dinners…some people do, but dinners are enough planning for me! 8. 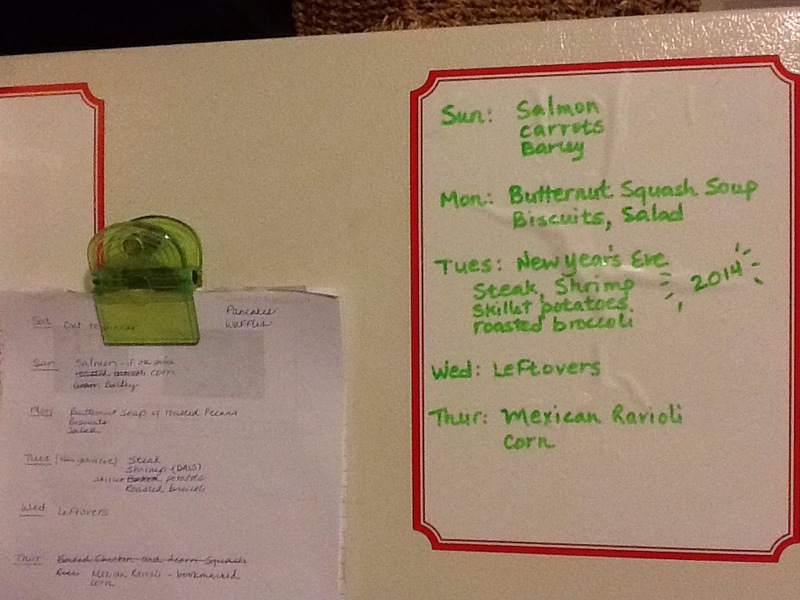 Finally, I write out the weekly dinner menu on a “white board” decal that is on my refrigerator, so the rest of the family can see what we’re having (and as a reminder to myself, so I remember if things need to be taken out of the freezer or prepped ahead of time, etc.). Things don’t always go exactly according to the plan each week…sometimes “Chipotle Takeout” was never on the Menu Plan, but it mysteriously shows up on our dinner table, nonetheless. And sometimes the side of acorn squash that was supposed to accompany the chicken is MIA…but luckily my family is pretty flexible…and will gladly accept a raspberry pop tart as a substitute! Quick tip…you know how you never use the whole can of tomato paste? So then you stick it in the fridge, thinking that you’ll use it within the week. Then 2 months later, when you finally get around to cleaning out your fridge, you find it…and throw it out. Next time, scoop out 1 tablespoon size portions from what’s left in the can. Put them on a piece of parchment or wax paper on a small tray and freeze. When they are frozen, take them off the tray and put them back in the freezer in a freezer bag. 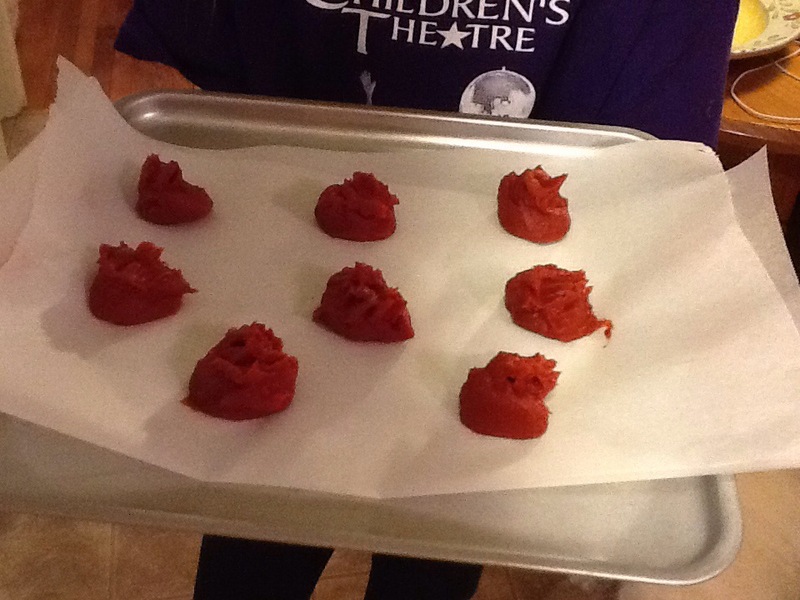 Now, the next time you need tomato paste, you’ll have convenient 1 tablespoon size portions ready to use. 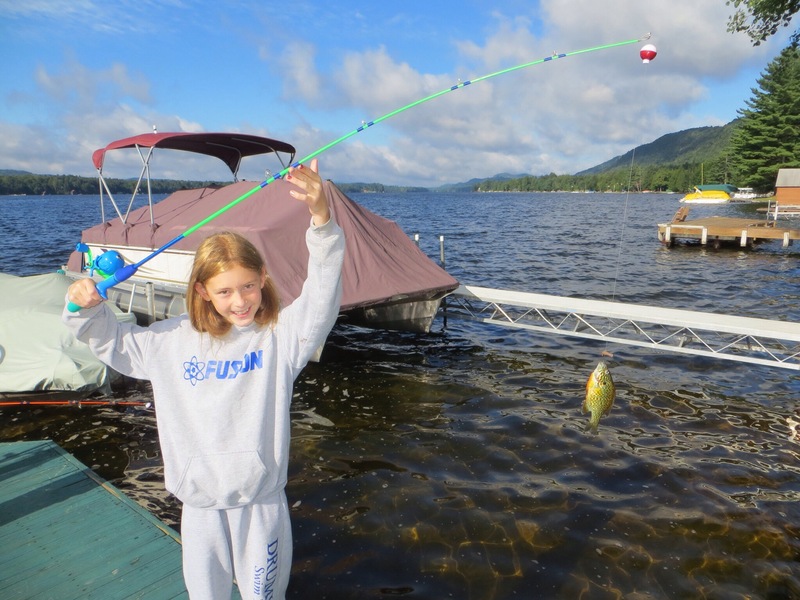 Will Your Kids Eat Fish? I spent my entire childhood convinced that I did not like fish. I would eat fish sticks and shrimp and, ironically, I declared that “Red Lobster” was one of my favorite restaurants…but, no…I was not a fan of fish. If it was not breaded and fried beyond recognition, I wrinkled my nose at it. The good news is that ,eventually, I gave up my aversion to this particular food and now find myself trying to get my own kids to eat fish. There’s good reason to keep trying. Fish, especially fatty fish such as salmon, are a major source of omega-3 fatty acids, which are important for healthy brain and eye development in children. Omega-3s have also been shown to lower your risk of dying from heart disease. There has been some concern regarding contaminants like mercury in certain types of fish, but if you avoid larger fish like shark, tilefish, swordfish, and king mackerel, the health benefits outweigh the risks. This article and this one explain the health benefits and risks of seafood if you want to read more. If you want to entice your family to eat more fish (or to even try it at all!) here are some tips that you can try. 1. Introduce it early in your child’s life and include it on the menu weekly. 2. Buy the freshest fish you can and use it the same day if possible. 3. Make sure there are no bones in the fish. We rarely find any in the main types that we buy (salmon and codfish). 4. Start with mild tasting fish like cod, halibut, sole and salmon. 5. Use a glaze or seasonings that you know your kids like. 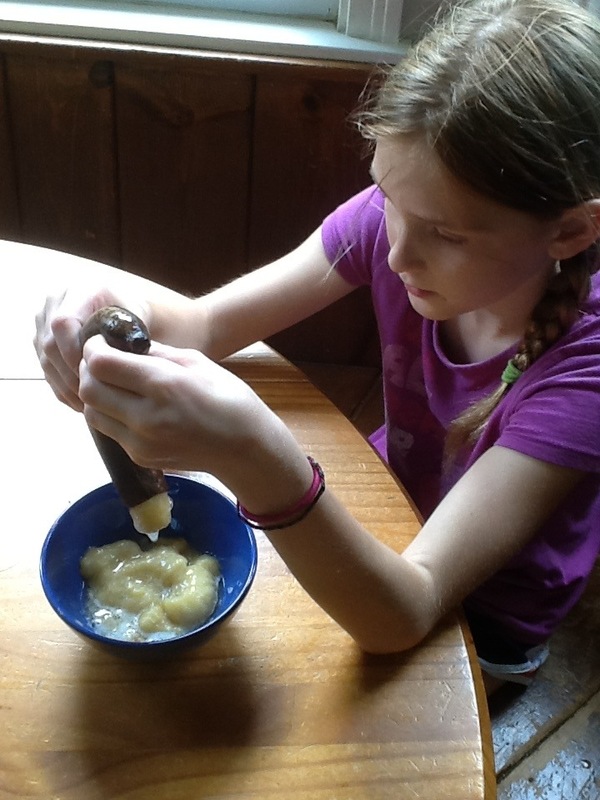 If your child does not like sauces and seasonings, just stick with something simple like butter and salt. 6. Serve the fish in very small portions. Put small, bite sized pieces on toothpicks to dip in a sauce. 7. Try a variety of presentations…fish kebabs, fish tacos, and fish sandwiches on a bun are all ways that allow you to customize with fillings and toppings. We usually prepare fish very simply…oil or butter a baking dish, sprinkle salt and pepper on the fish and dot it with butter (or drizzle with olive oil) and then bake for 15-20 minutes in a 375 or 400 degree oven, depending on the fish. 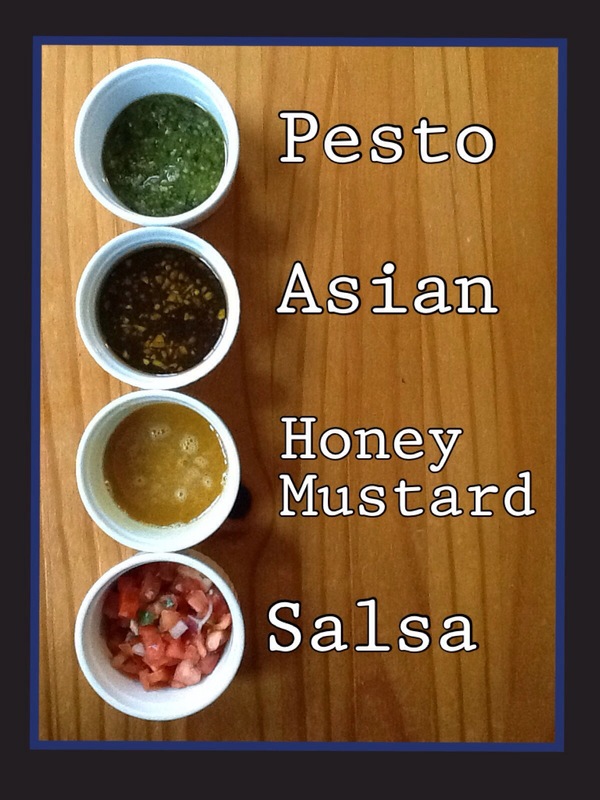 Pictured below are some simple sauce ideas to use with fish and I’ve included a recipe for an Asian sauce from Katie Workman’s cookbook, “The Mom 100 Cookbook”. Put all the ingredients in a small bowl and whisk to combine. You can pour some of the sauce over salmon before you cook it, rubbing it in with your fingers. Then drizzle the remaining sauce over the fish after it’s been cooked. Or use the sauce for dipping the cooked fish into. I guess this should be more of a summer post, but we are in the middle of an amazing stretch of sunny, warm weather here in the Northeast…and it’s just making me feel like writing about ice cream! As with many food products that we buy, ice cream has been sabotaged by the food industry. While it has never claimed to be anything more than a treat, the ice cream that our parents ate was quite different than the ice cream of today. And not just because a cone only cost a quarter back then. Ice cream is supposed to consist of things like cream, sugar and milk…but go take a look at the list of ingredients on the carton sitting in your freezer right now. Unless you make your own, the version that you have might list things like carrageenan and mono & diglycerides. I looked into these ingredients and am thinking that I don’t really want them in my ice cream! From Dr. Andrew Weil’s website, “Carrageenan is a common food additive that is extracted from a red seaweed, Chondrus crispus, which is popularly known as Irish moss. Carrageenan, which has no nutritional value, has been used as a thickener and emulsifier to improve the texture of ice cream, yogurt, cottage cheese, soy milk and other processed foods.” He goes on to discuss studies that have shown carrageenan to be harmful to human health and he recommends that you avoid foods that contain it, especially if you have irritable bowel syndrome. According to the Live Strong website, mono and diglycerides are food additives that help to extend the shelf life of processed food. They help ingredients containing fat to combine with ingredients containing water. They may contain trans fats, but because they are classified as emulsifiers rather than lipids, the FDA does not require them to be labeled as trans fats. How sneaky is that?! There are ice cream brands out there that stick to basic, natural ingredients, but as is usually the case, they are few and far between. Breyers used to proclaim that they used all natural ingredients, but since 2006, they have reformulated many of their products (as did their competitors) to the point where there is not even enough milk and cream to qualify as ice cream…they have to call them “frozen dairy desserts”. Sigh…I’m just shaking my head here. 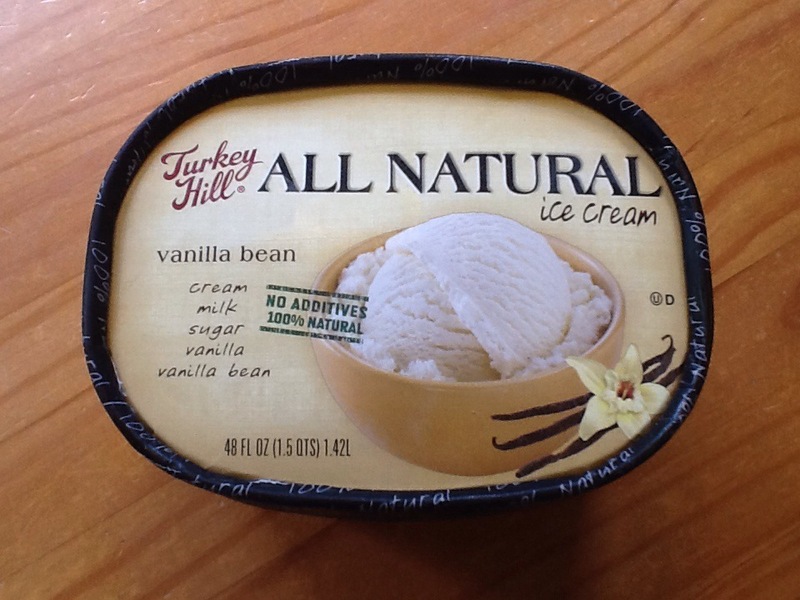 Our current go to ice cream is the Turkey Hill All Natural Ice Cream brand. Be careful to buy the kind with the black around the sides of the lid. Their other products are not all natural. By the way, I apologize for not embedding links into this post to take you to Dr. Weil’s and the Livestrong websites…Apple updated their operating system…and things are just not functioning the same around the old iPad this week…I barely knew what I was doing before…and now I am quite confused. I’ll have it figured out soon…maybe. Organic Apples in Central New York! There are many reasons to love Fall in Central New York and at the top of my list is apple picking. My grandparents farmed an apple orchard near Canandaigua, NY and my cousins and siblings and I spent many happy fall afternoons “helping” with the apple harvest. I realize now, we probably weren’t all that helpful, but we loved being a part of it. We watched in awe as hundreds of apples rolled along the huge sorting machine in the barn, the best ones eventually making their way into the bags to be sold to the customers. Now that I have children of my own, taking them apple picking brings back so many of those memories. New York State is the second largest grower of apples in the United States (the state of Washington is first) so it’s obviously quite easy to find local sources of apples where we live. But if you are trying to find local organic apples, you may be searching for awhile…they are hard to find. I have stood in the produce section of my local grocery store many times looking at the beautiful organic apples from Washington State and wondering…where are the organic New York apples? So I did a little investigating and this is what I found out. Washington state has a much drier climate than New York and because of the humidity levels here, our apple growers must deal with many more insects and diseases which threaten the apple crops. The best that most New York apple growers can do is to use IPM which stands for Integrated Pest Management. IPM is a combination of limited conventional pesticide spraying and sustainable farming practices in order to manage, rather than fully eradicate the insects and diseases. While this is a big improvement over the spraying that used to be done, it is virtually impossible to convert an existing conventional apple orchard to an organic one. You, essentially, have to start over in order to be completely organic. The good news is that there is an apple grower here in Central New York who has done just that. 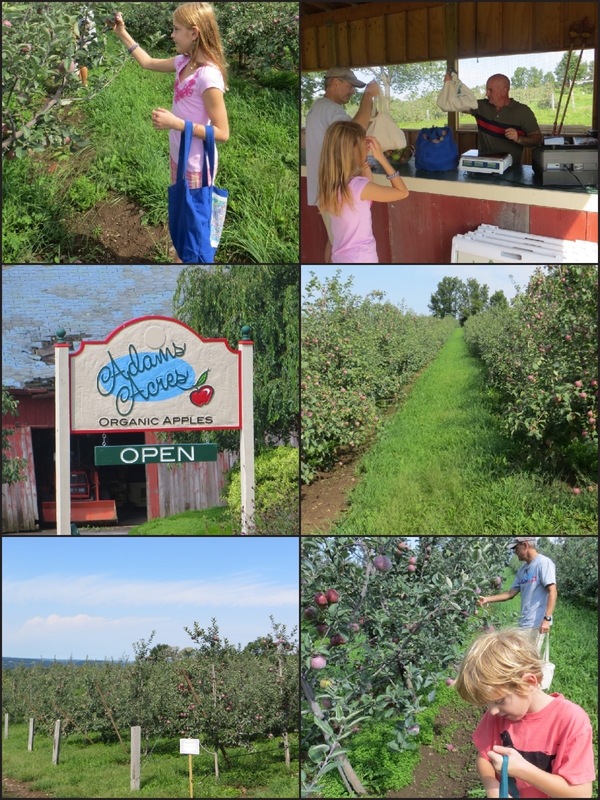 Bill Adams and his family opened Adams Acres a few years ago on a beautiful piece of property in Jamesville, NY. Their orchard is filled with apple trees that were planted in 2008 and have never been sprayed with conventional pesticides. Bill uses strictly organic farming practices and is an NOFA certified grower. My family and I had a chance to check out their apple orchard this past weekend and came home with several bags full of delicious Dayton apples. The trees are dwarf trees so the fruit is all within easy reach…the kids loved that! I was surprised at how pretty the apples were. When reading about organic apples, I had learned that they are often more prone to skin discoloration and don’t look as flawless as their conventional cousins. These apples did have a slight milky white film on them and Bill explained that this is from the clay that he sprays on to deter insects, one of the several organic practices that he uses. The film rinsed off easily when I washed them. Oh…and one more thing…the price of organic apples from Washington at our local grocery store? $2.69 to $3.99/lb. The price we paid to pick local organic apples? $1.30/lb. Adams Acres is open on Saturdays and Sundays throughout the Fall, from 10-5. They are located at 7047 Sevier Road in Jamesville, NY. They are also hosting a U-Pick Organic Apple Party on Sunday September 22nd, from 10-2, along with Farmshed CNY and other local farm vendors. Be sure to stop by and support these folks. Maybe one day soon there will be more than one organic apple orchard in Central New York! We have about 12 more days until school starts back up. In many parts of the country, kids have already started skipping back to school, bright shiny new back packs slung over their shoulders, Moms and Dads doing the happy dance brushing away tears of sadness as their children wave goodbye and become SOMEBODY ELSE’S PROBLEM for the next 6 hours. No, no…of COURSE, I am just kidding…I have cherished every moment…all summer…EVERY moment, I tell ya! But, all good things must come to an end. As you start up the new school year, there is something I want to tell you about the products we are buying for our lunch packing endeavors. I’m about to lecture here, but it is important…so bear with me while I rant for a few paragraphs. When you see something in the grocery store that says “Look, Mom! Look how easy we’re making this whole lunch packing thing for you! Make a PB&J sandwich? Noooo…you don’t have to do all that work…we’ve done it for you! Why, you don’t even have to actually pack the lunch if that’s too much…here, look…we’ve put together a wonderful, kid approved combination of sugar, salt and artificial flavors and colors…all you have to do is throw it in the bag…done!” When you see these items in your store, run…I repeat, run…very fast…away from these things. Because you know they have you right where they want you. You are probably sleep deprived. Maybe you have a baby on your hip or a toddler running away from you in the store. You might be a stay at home mom (or dad) who has to prepare and clean up about 21 different meals and snacks every day and THIS…this cute little premade sandwich in a package…with the crusts even removed for cryin’ out loud…this is what will save your sanity. Or, you are a parent who has to leave the house every morning to go to work and you have about 14 seconds to get those lunches packed. You’re thinking about how in the morning, maybe you could actually have time to drink that cup of coffee instead of spilling it all over your work clothes as you are running out the door because it took so long to scrounge around your pantry trying to find those stupid “real food” items these crazy blogs keep telling you to pack. But I am convinced that the more desperate we feel about packing our kids lunches, the more those packaged food companies have us wrapped around their little fruit roll ups. We have to take a step back and stop being overwhelmed by lunch. We have to plan ahead. We have to ask our kids, “Which two or three vegetables and fruits will you eat in your lunches this week?” And then buy those items, cut them up so they are ready to throw into the lunch containers. We need to stop putting juice boxes and sports drinks and vanilla flavored milks into the bag. Water is simple and cheap and exactly what they need. If you are grabbing those convenience lunch items off the shelves, before you throw them into your cart, I ask that you just look at that ingredient list. If the first few items on the list are not actually food (and sugar, my friend, does not count as an “actual food” when it is your kid’s lunch) then there is a problem. into my children’s lunch bags. We’re not horrible parents. Most of us are just doing the best we can. But I think many of us, myself included, can do a little better. Many of us have enough time to keep up with all of our Facebook friends and most of us have the financial resources to purchase the things that are important to us. Let’s make our children’s lunch important this year. As you start up the new school year, try making 3 simple changes to help your kids eat better while they are at school. Okay…maybe these are not actually simple to implement…your kids are mad enough that they have to get up at 6:30 AM and now you’re going to take away their chocolate milk and their Go-Gurt…sigh. 1. Ditch the juice boxes, sports drinks, and flavored milks. These options usually have as much added sugar as soda. Send water in a stainless steel thermos. They will complain…ignore. Or maybe let them have a sweetened beverage once a week. 2. Make fiber a priority as you figure out what to pack. Google foods high in fiber, make a list, and sit down with your kids and ask them…what foods on this list would you like in your lunch? Fiber helps our bodies to use the natural sugars in foods for energy, thus avoiding the sugar high and inevitable crash as they sit down to learn about fractions after lunch. Fiber also helps us to feel full longer. Note that it is important to drink plenty of water when you are increasing the fiber in your diet. 3. Switch your bread from white to 100% whole wheat. Find a brand of bread that does not have high fructose corn syrup in it. If your child will only eat white bread, just skip the traditional sandwich. There are so many other options. Your best friend Google will help you find lots of ideas! I will try to post pictures of some of my kids lunches once we get into the school year, but there are lots of sites out there that do this much better than I ever could. And lastly, if you are reading this and saying to yourself, “Pack lunch? That’s crazy talk! My kid buys lunch every day!” Investigate what kind of lunches your school serves. There are more and more schools out there that are trying to improve, but there are still a lot of scary school lunch programs around. If you are not happy with what your school has to offer, but you just can’t even begin to think about trying to pack lunch, start small. Commit to making lunch once a week, on Sunday night for the Monday lunch. 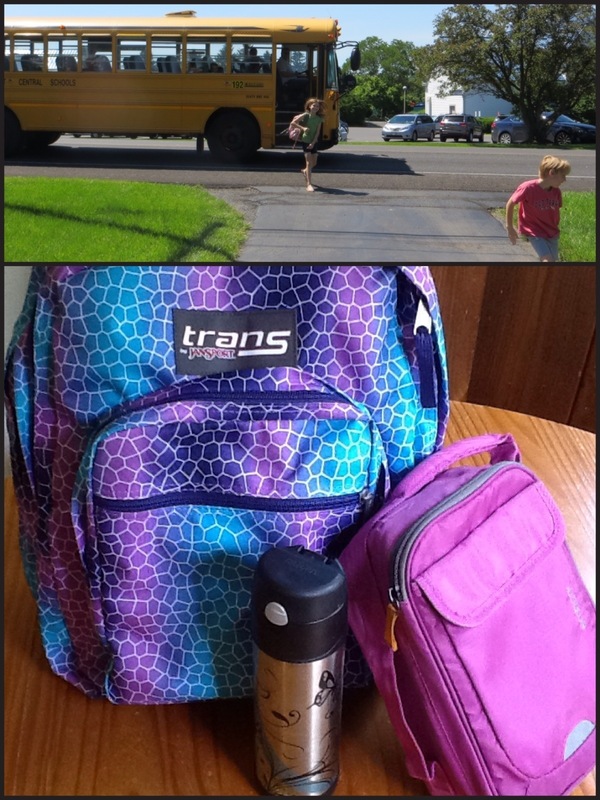 If your kids have already started school, I hope they are having a great year so far! 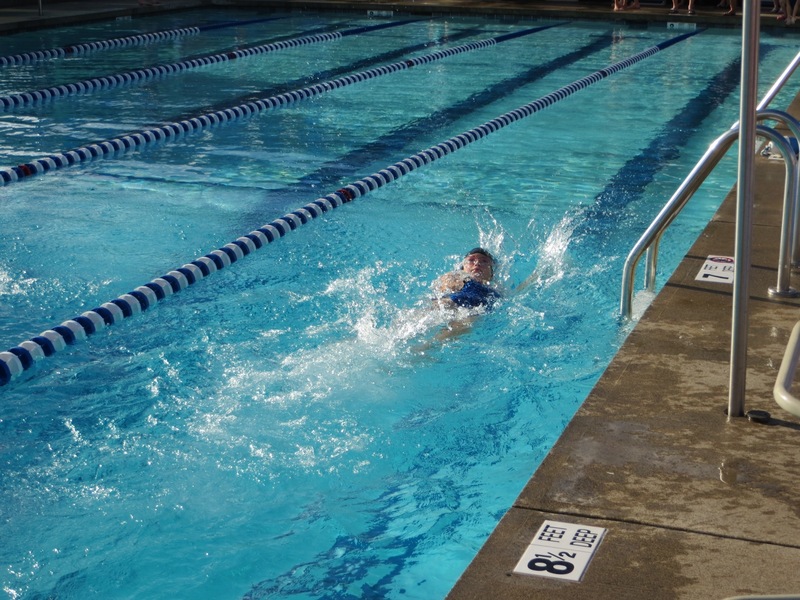 And for the rest of us…it’s off to the pool for one more week! The banana…such a simple, wonderful food. It comes in it’s own packaging, is crammed full of good stuff, doesn’t have to be refrigerated, tolerates being thrown into a backpack or a purse, can be used to add sweetness to baked goods and smoothies, one of the least contaminated fruits in terms of pesticides, inexpensive…I could go on and on. The humble banana is a “real food” lover’s best friend. In my last post, I wrote about food waste. You should never have to throw out a banana! Most people know that over ripe bananas are the best kind to use when making banana bread, but here is a tip that maybe you didn’t know. If you don’t need them immediately, put your over ripe bananas in the freezer. When you are ready to use them, microwave on high for one minute, cut one end off, and squeeze the soft banana out. Very fun for kids to do. And when you do get around to making that banana bread, here is an easy recipe for you! This tip and the recipe are both from Lisa Reid’s book, “Raising Kids With Just a Little Cash”. 2. Mix all of the dry ingredients into an ungreased 8 or 9 inch baking pan, stirring with a fork until well mixed. 3. Blend in the wet ingredients until smooth. 4. Bake 30 to 35 minutes. This is my fridge…no, silly, it does not usually look like this…but I’m carefully cultivating an image here on this blog…so we’ll just pretend that it always looks like this. It looked like this when I took this picture because I had just finished reading Simply Being Mum’s blog where she posts each Friday about the food that she has wasted that week. She does not waste much. The accountability of taking a photo of her fridge each week and blogging about the withered lettuce and the moldy salsa seems to have transformed her into someone who really pays attention to her food and really appreciates what she has been blessed with. I hope that can happen to me. I waste a lot of food. I am embarrassed by how much food I waste. I shop each week with grand intentions of all of the wonderful, homemade, minimally processed meals and snacks I am going to make…and then the end of the week comes around and I'm dumping stuff, left and right, into the garbage. A half a watermelon gone bad, a container of buttermilk for those pancakes I never got around to making, a forgotten about tub of cream cheese waaaayyyy in the back. And those grapes!! Why do they sell so many in those bags? We can never seem to get through them before they shrivel up. I know, I know…I could just buy a smaller quantity…but they look so delicious and I am always convinced that we will eat them all. I don't know if I will ever have the courage to document my weekly food waste, but I have begun to think more about this and am trying to put some strategies in place to help. Those of us who are blessed with the resources to purchase fresh, plentiful food must be careful to never take this privilege for granted. I, for one, have some serious work to do in this area. Here are some tips that I took away from Simple Mum's site. 1. 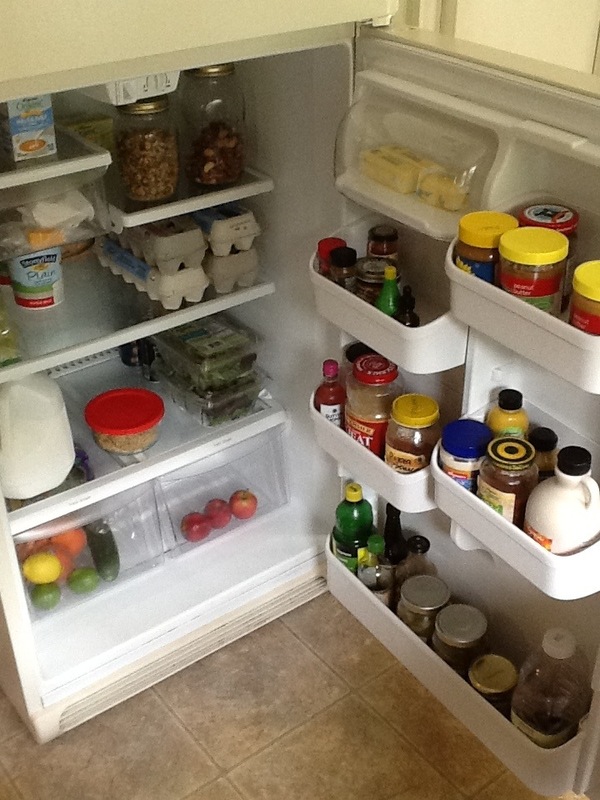 Before you make up your grocery list each week, take some time to clean out your fridge and figure out what you have. If there are items that need to be used up soon, plan your next few meals around those items. 2. Go to a site like Allrecipes.com where you can enter an ingredient that you need to use up and search for recipes using that particular item. 3. If you find something that's starting to look "sad", think about how you might salvage it. Berries can be thrown into a smoothie, bell peppers can be roasted, lemons and limes can be cut up and frozen to be used for drinks later. 5. If you ever do achieve the minimalist look in your fridge (a small family could live in here!) make sure to put something in there to help keep the refrigerator operating efficiently. Apparently, an empty fridge uses more energy. Simple Mum suggests putting containers of water or other beverages on the shelves. So go check out your cold storage and rescue a couple of limes. And the next time you go food shopping…remember…you will never eat all of those grapes. 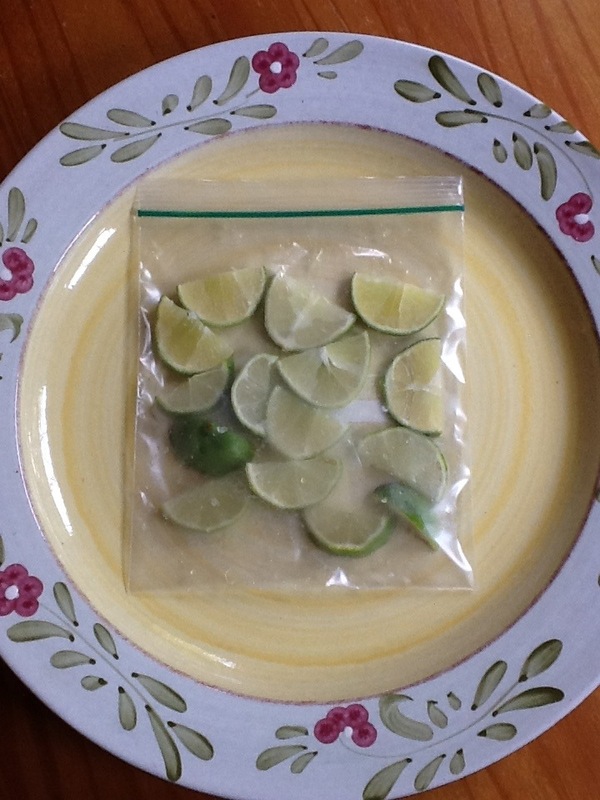 Frozen limes…just waiting to be thrown into a gin and tonic! All year long, I complain about the lunches that the school serves my kids. Then, finally, we arrive at summer vacation and this happens…. Okay…fine, School Lunch Program, you win. I’m sorry. I admit it. I am no better than you at feeding my children. I know that there are parents out there who don’t let this happen. Moms and dads with spines. Parents who can tune out the relentless begging and whining for the magic, icy drink that screams “Summer!” I am not one of those moms. I cave, every time. There is an evil snack shack at our pool with an innocent looking teenager sitting inside just waiting…waiting the approximately 6.4 seconds that it takes from the time we arrive at the pool until one of my kids asks, “Mom…can I get a Slushie?” If these slushies were simply an occasional indulgence, I would be okay with that. But we are at the pool almost every day. I need some sort of strategy. So I am thinking about implementing a two Slushie per week limit. I will purchase one, and they can buy a second one with their own money. 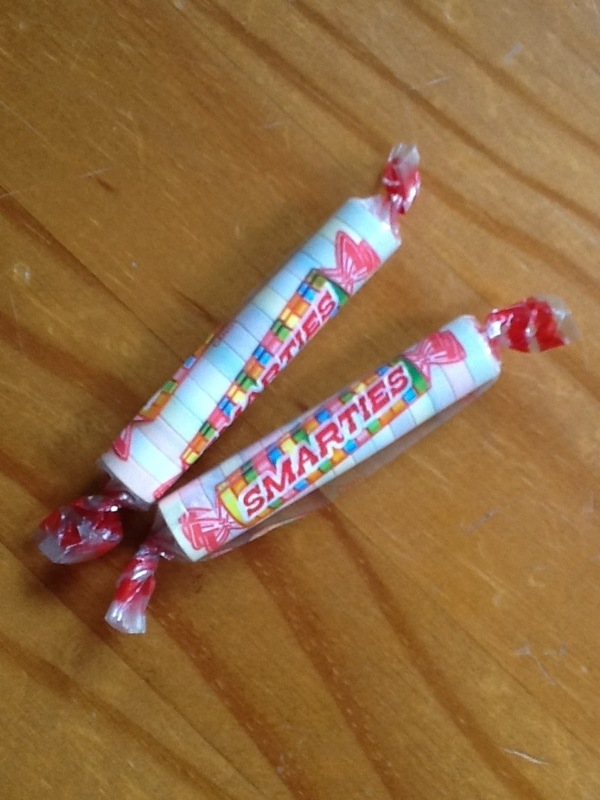 Yes…I am so smart…I feel much better now. I am on top of this…bring it on, Evil Snack Shack. 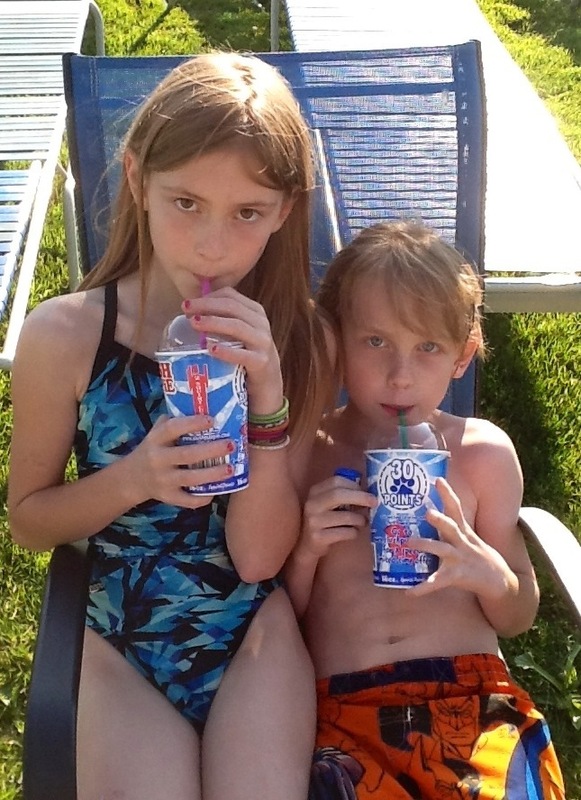 “Mom…can I get a pixie stick?” Grrrrrr…. Despite all of our planning, sometimes dinner looks like this. And that’s okay. (See those carrots on the plate…that’s good, right? I promise you…he did eat the carrots!). My son had not one, but two events to attend tonight…back to back…so I resorted to feeding him dinner at 4:00, right after he got off of the school bus! We know that nights like this are going to happen once in awhile. And in my opinion, that’s exactly what packaged, processed food is for. Our favorite boxed Mac & Cheese is a brand that doesn’t have any artificial flavors or dyes and the hot dogs are uncured, so there are no added nitrites or nitrates. Then make sure to throw some fruits or vegetables onto the plate and off they go to karate and cub scouts. So yes, it’s from a box…and no, it’s not perfect. But, you know what? 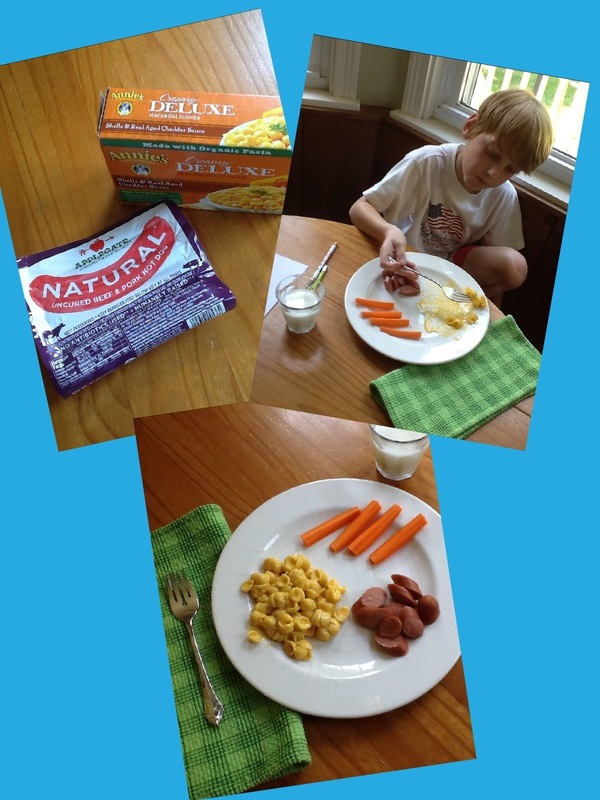 When you’re eight and it’s summer and you’re eating hot dogs and Mac & cheese (and carrots! )…that is kind of perfect.